With thanks to you, breakthroughs and improvements in medical practice for people with gastro-intestinal cancer are possible. Your support provides the answers to the many unanswered questions and together, one day, we can make GI cancer a disease of the past. By conducting research in Australia, people with GI cancer can access new treatments 3 to 5 years earlier than if research was to take place overseas. For the family and friends of people suffering with GI cancer, this extra time with those they care about is priceless. 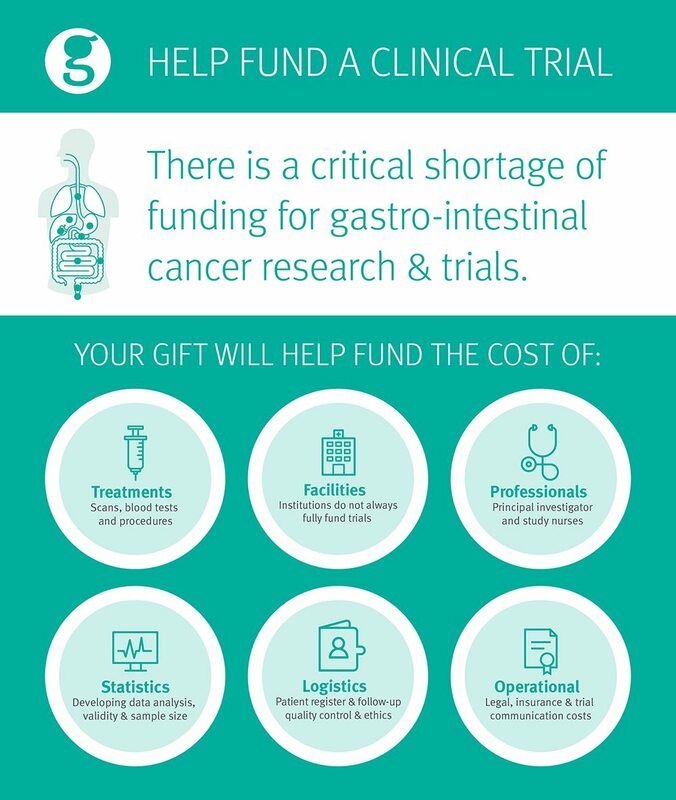 The GI Cancer Institute – through the Australasian Gastro-Intestinal Trials Group (AGITG) has been undertaking independent research since 1991 and fundraising since 2001. As a not-for-profit, we rely on the generosity of individuals, community groups and corporate sponsors to help fund our research. Fundraising helps us to conduct clinical trials and research into GI cancers – including oesophageal, stomach, liver, pancreas, gall bladder, bowel cancer and ‘other digestive’ cancers – and finding better ways to treat the disease. Clinical trials are not about laboratories and test tubes; they involve real people fighting a real disease. Using innovative research designs and cutting-edge technologies, our research will enable the best care and lead to better outcomes for all patients with GI cancers. For people with advanced GI cancer, where a cure is not possible, our trials aim to extend and improve the quality of their lives and the lives of future patients. There are many ways you can make a difference to the 24,000+ Australians diagnosed with GI cancer each year. Your support is vital in funding our research now and into the future. Choose an option that best suits you to show your support. Or for more information on how to get involved, please contact us on 1300 666 769.